Many patients think that 3D dental x-rays are just like traditional x-rays for the whole mouth, but they are actually much more complex. In recent years, more and more dental offices have invested in this technology to improve the precision of their advanced dental procedures. Traditionally, only specialty dental offices had this complex technology, but now, dentists understand how much 3D technology will improve the patient experience and many of them now incorporate these advanced radiography systems into regular treatment. Keep reading to find out some of the ways that 3D dental imaging is raising the standard of care for dental patients. Traditional x-rays only give us a limited view of your smile. We see one, flat image of a single section of your teeth. A 3D dental x-ray gives us crystal clear images of the entire face and mouth and how they work together, but they also allow us to zoom in and have a complete picture of the innerworkings of a single tooth. 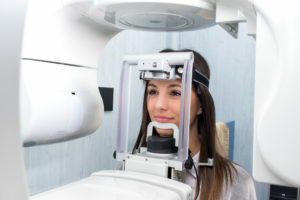 In order to capture the same number of images using traditional x-rays, patients would need to be exposed to a significantly higher level of radiation. Even digital x-rays that are much more quickly captured than traditional radiographs can’t compare to the rapid capture of 3D dental x-rays. With one 3D x-ray scan, hundreds of images are captured. That means with minimal radiation exposure, we’re able to have access to crystal clear images of your entire smile as well as the minute inner parts of the teeth. Even though 3D x-rays have improved the ability to capture complex images of your oral and facial structures, that doesn’t mean 2D x-rays are no longer necessary. When it comes to annual checkups, a traditional set of 2D x-rays should be adequate, but if your general x-rays indicate an area of concern, 3D scans can be captured in order to give us a clearer understanding. The face is made up of nerves, blood vessels, and connective tissues that can be easily damaged when advanced dentistry services aren’t planned properly. 3D dentistry allows us to safely plan for even the most advanced procedures and protect your oral and overall health. Jonathan Smiley, DMD and his Waverly dental team are dedicated to staying at the forefront of dentistry techniques and technologies. We use 3D radiography regularly to improve our diagnosis, treatment planning, and procedures. The Smiley Family Dentistry team offers a wide range of dental services for patients of all ages to help them achieve and maintain their healthiest smiles. If you’re new to Waverly or one of the surrounding communities, call our office to find out more or schedule an appointment with us. If you’re interested in learning more about dental services, come back to read our blog regularly.